This entry was posted in Auto Insurance, Blog, Car Insurance, Car Safety Tips, General, Homeowners Insurance, Travel Insurance on 06/07/2017 by Alejandra Vazquez. 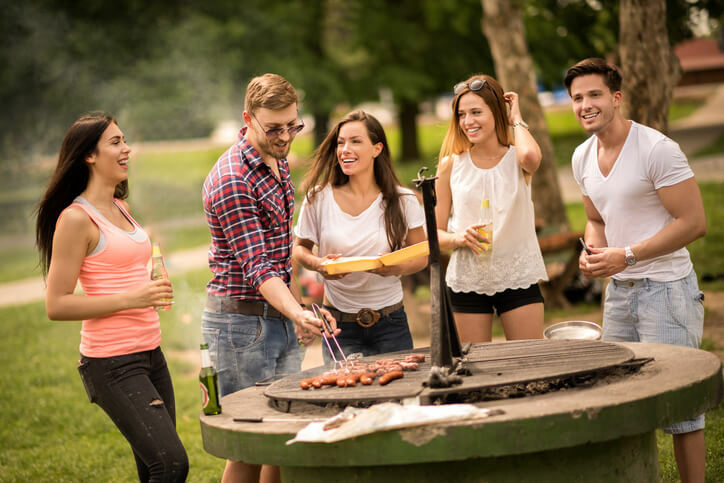 Springtime and summer can be great times to finally get your family outside and enjoy barbecuing together, but there are some safety measures that should be put into place. If you have the security of the best renters insurance available, you will be covered if a barbeque accident happens. Here are five tips for your family to gear up for barbecue season safely. Protection when it comes to barbeque heat and flame dangers should be taken into account when deciding where to locate your grilling space. Keeping barbeques away from your home is important, but also keeping them away from fences and other outdoor structures is essential. The National Fire Protection Association points out that more than 8,900 house fires are caused by barbecues yearly, and the peak period for these accidents is between May and August. When picking out a grill for your family, you might enjoy the flavor of charcoal grills, but opting for a gas grill may be a safer option. Gas grills can be easier to control on smaller patios or in windy areas, and will be less likely to start a fire with stray sparks or embers. It’s a good idea to set a timer or reminder to turn off your gas grill when you’re done so that you don’t keep the gas on longer than necessary. You might have years of barbecuing experience under your belt, but it could be an entirely new experience for your kids. Before barbeque season ramps up, sit them down and remind them that the barbecue isn’t a toy. They need to be safe and not play around the grill unattended. You can teach them about grilling, but remind them this activity should always be supervised. If you have a great backyard, you might want to invite over friends and family for springtime and summer barbecues. Assess your yard space and keep capacity issues in mind for safety. Avoid drinking if you are hosting and manning the grill so you can pay attention to the task at hand. Have fun and relax, but keeping your home and family protected comes first. While you might love to barbeque, it’s important to understand and respect your landlord’s guidelines. You may be asked to use a more common area of an apartment complex or a gas grill rather than coal. The rules are in place for a reason, so be sure to follow them. Another way to safeguard your family is to compare renters insurance rates and sign up for additional coverage in case you do have fire-related incidents. Barbecuing can be a fun way to entertain and make a great meal, but working with fire can be dangerous. The best way to protect your family and home during barbecue season is to have some precautions in place, including the best renters insurance to fit your needs. While your landlord might have insurance, renters insurance will protect your personal items in case an accident happens. Call Freeway Insurance today to find a great selection of renters insurance plans. Our team is available to answer any questions you may have about your renters insurance. To learn more, call us today at (888) 443-4662.